Spoiler alert! If you haven’t read The Red Pyramid or The Throne of Fire, turn back now! 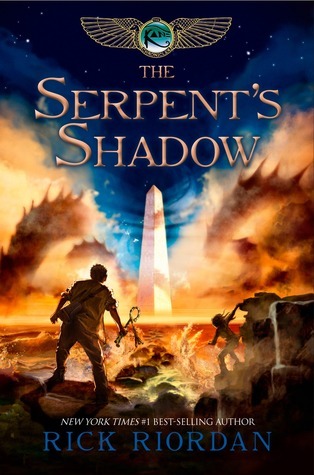 If you don’t want to know what happens in the third book of Rick Riordan’s Kane Chronicles, The Serpent’s Shadow, turn back now! This will be your only warning. Normal is not a word that the Carter and Sadie Kane are familiar with. They are magicians descended from Egyptian pharaohs, and they often communicate and take on the forms of Horus and Isis, gods of ancient Egypt. They run a school for young magicians out of their house in Brooklyn, their dad is Osiris (god of the afterlife), and their mom is a ghost. Sadie has feelings for two different guys: Walt, a descendent of King Tut who is cursed with a very short lifespan; and Anubis, god of the dead who tends to take on the form of a really attractive teenage boy. Carter is enamored of a fellow magician, Zia, who spends most of her time babysitting Ra, a senile sun god. As if life is not abnormal enough, add in a god of chaos, Apophis, who wants to swallow the sun and destroy the entire world. The incredibly ginormous job of stopping him falls to Carter and Sadie and their merry band of misfits. It’s up to them to unite magicians and gods in fighting Apophis and his minions, but how can they possibly destroy something so huge, terrifying, and powerful? Well, they may have found a way, but it involves trusting an evil psychopath (not usually a smart move) and risking their own lives (also not preferable). Carter and Sadie will have to face unbelievable horrors to save the world, and it still might not be enough. Can the Kanes defeat the god of chaos without losing themselves? Can they save those they love in the process? Is there any hope for a normal life if their longshot of a plan actually works? Probably not, but they have to try. In a world that is falling into chaos, it’s up to two teenagers to restore order. (I was laughing as I wrote that last bit.) Read The Serpent’s Shadow to find out if their completely crazy heroic quest saves the world or destroys it forever. Danger, danger! If you haven’t already read Leviathan and Behemoth, the first two books in this amazing series, retreat now before proceeding with this post on the final installment in the Leviathan trilogy, Goliath. You must read the first two books to understand what’s happening in this final book. Read on at your own risk! Early this year, I began reading an amazing series that would introduce me to an alternate history of World War One–a world filled with fabricated beasts and technologies as dangerous as they are awe-inspiring. This series began with Leviathan, a phenomenal book that made be seek out more steampunk fiction. I continued this series with Behemoth, a book that, in my opinion, was even better than its predecessor. It was action-packed, tense, and, again, presented an alternate view of history had certain beasts and machines been present. Well, today I finally finished the highly anticipated third and final book in this series, Goliath. This book was–at least to this reader–the best book of the Leviathan trilogy (and one of the best books I’ve read this year). I am sad that this journey is over, but I am very satisfied with how it ended. I hope you will be, too. Goliath opens with Alek and Deryn once again aboard the Leviathan. Deryn is still keeping her true identity a secret, and Alek is lamenting his uselessness aboard the airbeast. Both of them, however, are about to have their worlds shaken once again. When the Leviathan is ordered to Siberia to pick up a mysterious package and a maniacal scientist, secrets begin to unravel. Who is this madman the Leviathan has rescued, and what is his endgame? While Deryn works with Dr. Barlow to uncover what the scientist–one Nikola Tesla–is really up to, Alek is confronted with the alarming truth about his best friend. The boy he believed to be Dylan Sharp is actually a girl named Deryn. She’s been masquerading as a male soldier the entire time they’ve known each other. He’s trusted her with all of his secrets, and she’s been lying to him this whole time. How can he trust her now? Can their friendship recover from this? If it can, will things be different between Alek and Deryn now that the truth is out? Life is tense onboard the Leviathan. With a mad scientist, a prince, a girl masquerading as a boy, reporters, and various beasties on board, how could it not be? Well, thanks to Mr. Tesla, things are about to get even more tense. His invention, a machine called Goliath, may have the power to end this war for good. It is up to the crew of the Leviathan to get Tesla to New York for a demonstration of this weapon’s capabilities. This journey takes them through Russia, Japan, Mexico, and across the expanse of the United States–a neutral power in this global war. The airbeast encounters danger at every turn. What dangers will it encounter once it arrives in New York, and will they be enough to bring the U.S. into this war? Or will Tesla’s weapon stop the tide of war in its tracks? As the Leviathan gets closer to completing its mission, Alek and Deryn are forced to face the truth of their new relationship. But how can they possibly be together when war is tearing them apart? Can they find a way to end this war and preserve their young love in the process? Or will the machinations of a madman end everything for good? 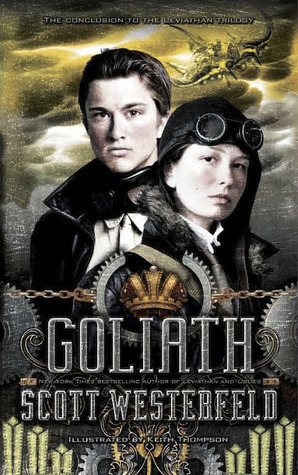 Read Goliath, the trilling conclusion to the Leviathan trilogy, to learn how two young people can change the world around them. As is often the case when I read a book as awesome as this one, this post doesn’t even come close to depicting how amazing Goliath–and the whole Leviathan series–is. Words fail me, and that is saying something for someone as verbose as I am. I adore this series, and I think Goliath is the best of the trilogy. I am totally satisfied with the ending. It tied things up nicely, but it still left room for readers to use their imaginations in determining how the future plays out for Alek and Deryn. As with Leviathan and Behemoth, there is an afterword that gives information about the true events that were the basis for Goliath. It is amazing to me that Nikola Tesla was actually working on a Goliath-like machine before he ran out of money. Just imagine what the world would be like now if he had succeeded. If you haven’t read this series yet, what are you waiting for? It’s wonderful, and I think readers from upper elementary grades through adulthood will find something to enjoy. 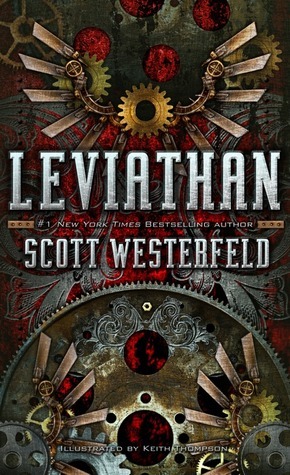 If you’d like more information on the world of Leviathan and author Scott Westerfeld, visit http://scottwesterfeld.com/. As for me, I will now mourn the end of this series, and move on to my next book. Happy reading. Warning!! Read Leviathan before continuing with this post. 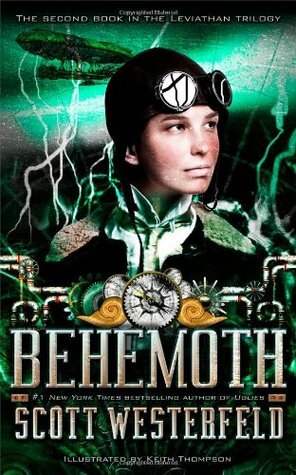 Behemoth is the second book in this amazing series. Behemoth picks up where Leviathan ended, and I think this second installment is more action-packed and anxiety-inducing that the first book. Alek and Dylan have grown closer during their time on the Leviathan, but the two friends are still harboring some big secrets. Alek has told no one that he is the true heir to the throne of Austria-Hungary, and Dylan–or should I say Deryn–is hiding the fact that she is a girl. Those secrets, although important, might just be taking a back seat to the war around them. The Leviathan is headed for the seemingly neutral city of Constantinople (Istanbul), but it soon becomes clear that they are not the only visitors to this all-important city. Alek, after learning that he will soon be considered a prisoner-of-war aboard the Leviathan, escapes the air beast into the streets of Constantinople. There he faces his own enemies and makes the acquaintances of certain people who would fight the German encroachment in their fair city. Deryn, still hiding her true identity, is given an important mission that will make possible the arrival of the British Empire’s most fearsome weapon, the behemoth. When complications arise, Deryn is forced to seek help from Alek and his new comrades. But can she, or Alek, trust these revolutionaries? And what will they do when it becomes clear that the Clankers have a powerful weapon that can stop the Leviathan, and any other beast accompanying it, in its tracks? Are they strong enough to fight the Clanker powers? Only time will tell. But can Alek and Deryn possibly keep their secrets when a war keeps bringing them closer together, or will these secrets only serve to drive them apart? Read Behemoth to find out how Alek and Deryn fare in a war neither of them truly understand. I really enjoyed this book (maybe even more than I liked Leviathan), and I think any fans of action, danger, and suspense will find something to love in Behemoth. I appreciate the illustrations by Keith Thompson. Like those in Leviathan, these pictures help me to visualize the various beasts and contraptions in this alternate world. There is also an extremely helpful afterword at the end of the book which explains how the events in Behemoth were similar to or different than the actuality of World War One. If you’d like more information about this series or any other by Scott Westerfeld, visit http://scottwesterfeld.com/. Alek is in the middle of a war. Actually, he is one of the reasons for the war. With the death of his parents, the world seemingly goes into a tailspin. Were Alek’s parents killed by enemies of the Austro-Hungarian empire, or did their allies, the Germans, betray them to start a war? Alek is really not sure, so he goes on the run to ensure his safety. A couple of soldiers, two trusted advisors, and a military Stormwalker are all that stand between Alek and certain discovery. If he is discovered, by either the Germans or their enemies, he knows he could share the same fate as his parents. Deryn dreams of serving in the British Air Service. There is just one problem–she’s a girl. With the help of her brother and a rather convincing disguise, however, Deryn–or should I say Dylan–is able to join up, and she, somewhat unwittingly, becomes a midshipman on the airship Leviathan. But the Leviathan is not just any airship. It is a biological ecosystem. The ship is made up of many different fabricated species working together to keep the “ship” aloft and on course. Deryn is thrilled to serve on this mighty beast. She gets to fly and be a part of something great. Things don’t stay great for long. War is coming to Europe, and both Deryn and Alek are right in the middle of it. When the two meet, it becomes clear that they will have to work together to survive what is coming. Can both of them keep their secrets in the midst of everything going on around them? Can the Leviathan prevail against the Germans’ war machines, or Clankers? And how will these two young people impact the world as they know it? Read Leviathan by Scott Westerfeld, and imagine the possibilities. I really, really, really enjoyed this book. For one thing, not many novels for young readers are written about WWI, so that was a nice change of pace. For another thing, I like weird stuff, and Leviathan had a lot of weird stuff in it, especially the fabricated animals. (By the way, Keith Johnson’s illustrations were especially helpful in bringing these beings to life. I don’t think my imagination could do any better.) I urge readers to take a look at the book’s afterword so that they can learn how much of the book is based on actual events. I’ve already read the second book in this series, Behemoth, and I’ll post that review tomorrow. I’m currently reading the third and final book, Goliath. In my humble opinion, every book in this series is ideal for upper elementary readers on up. If you’d like more information on this series, visit http://scottwesterfeld.com/.